The ALOGIC VGA Adapter 30P-VGA-Adp for iPad, iPad2, iPhone4S lets you mirror all the content on your Apple device on to an VGA-equipped TV, Display, Projector or other compatible diplay. 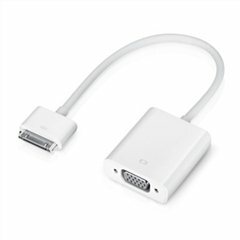 Your slideshows and videos from iPad, iPhone4, or iPod touch 4G can be shared with a VGA-compatible display at upto 720p. And for iPad2, and iPhone4S, video out can support upto 1080p.